When a Customer Wants a Deli Order "To Go"
Delis are known for providing high quality food to customers in a very brief period of time. In fact, this is one of the main reasons that customers choose to eat in a deli. They may not expect to get gourmet food, but they do expect to get tasty, wholesome food in a reasonable amount of time. Some customers need to make the eating experience even shorter by ordering their meal "to go." If this happens, you will need to approach these orders a little bit differently in order to satisfy your customer's needs and time constraints. Give your customers an accurate estimate of the time that is required to prepare "to go" orders. If necessary, overestimate the time by a few minutes. Customers do not like to wait very long for their orders, but one thing they dislike even more than waiting, is waiting longer than expected. An accurate estimate can solve this problem. You may want to make "to go" orders a priority over "dining in" orders. Customers who dine in are more likely to wait patiently because they will be sitting at a table rather than standing. Dining in customers can sip their drinks, munch on crackers, and enjoy conversation while they wait on their food; "to go" customers cannot. The most important thing to consider when preparing a "to go" order is wrapping up the order correctly. Hot food items, for example, need to be wrapped in heat preserving packaging such as Styrofoam or heavy paper. Wet food items, such as soup or wet salads, need to be fitted with secure lids to prevent spills during transport. When customers order meals "to go", keep in mind that the do not have access to the accessories, condiments, and conveniences that customers have when they dine in your deli. This does not mean they should be forced to go without these additions to their meal. Perform a quick evaluation of the meal that the customer ordered. If the customer has a side of French fries, will he or she need disposable packets of ketchup, salt, or pepper to go with those French fries? If the customer ordered a sandwich, supply him or her with napkins with which to clean up after eating. Customers who order green salads, soups, potato salad, chicken salad, or other items that cannot be eaten with their hands need to be provided with disposable cutlery. A little extra effort when assembling a "to go" order can go a long way toward improving your deli's reputation. 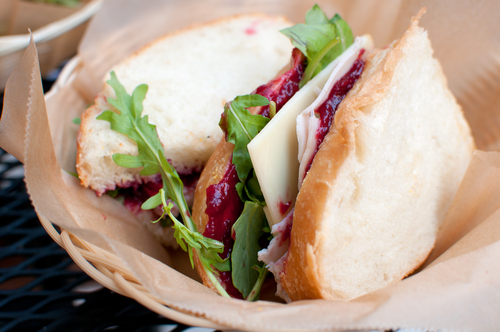 To go orders can be highly profitable for your deli. When customers order their meals to go, you get the profits from that order, while your customer does not take up any seating space. Also, by offering to go orders, you will be able to establish your deli as a great place to get a quck and tasty meal. If your restaurant is near a business center, this can be a huge marketing tool and provide a big business boost for your deli.